Thu., Jan. 4, 2018, 11:15 p.m.
SOUTH BEND, Ind. – Marina Mabrey scored 21 points, Arike Ogunbowale had 20 despite struggling from the field and No. 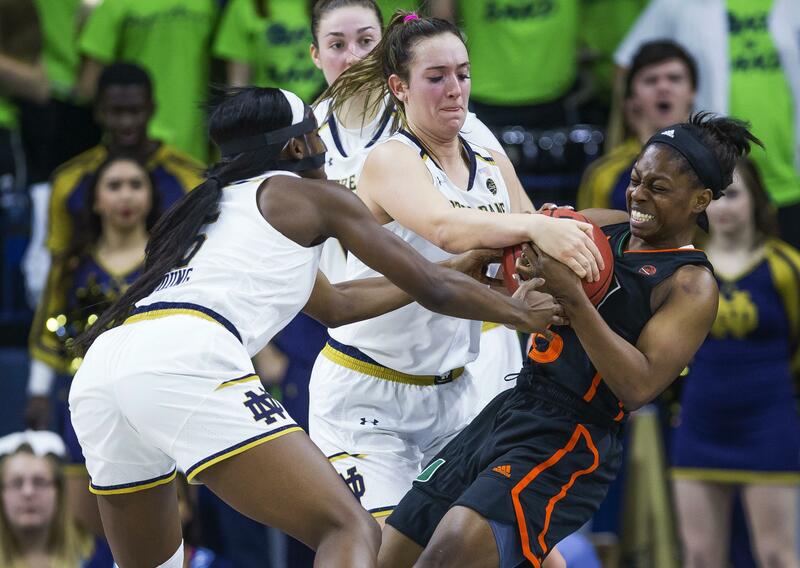 2 Notre Dame beat Miami 83-76 victory on Thursday night. Ogunbowale hit her first shot and then missed her next 12, going 28 minutes without a basket, before scoring on a rebound and hitting a free throw for a 62-57 Irish lead with 7:28 to play. Erykah Davenport scored 24 points for Miami (11-4, 1-1). LOUISVILLE, Ky. – Asia Durr had 22 points and came back from a first-half leg injury to grab a key rebound late that helped Louisville survive Duke’s fourth-quarter rally. Louisville (17-0, 3-0 Atlantic Coast Conference) appeared in control with a 15-point lead midway through the third quarter. But the Cardinals made just 7 of 26 shots in the second half, allowing Duke (11-4, 0-2) to and get to 63-60 on Haley Gorecki’s 3-pointer with 2:54 remaining. Gorecki led Duke with a career-high 25 points. OXFORD, Miss. – A’ja Wilson had 25 points and 15 rebounds, Alexis Jennings and Doniyah Cliney had 14 points apiece and defending national champion South Carolina beat Mississippi. The Gamecocks (13-1, 2-0 Southeastern Conference) had an answer for every Rebel rally and eventually pulled away in the fourth quarter. South Carolina shot 38 percent, including 8 for 27 from 3-point range. Madinah Muhammad scored 29 points for Rebels (10-5, 0-2). Mississippi State (16-0, 2-0 Southeastern Conference) broke a fairly tight game open in the third quarter by outscoring Arkansas 30-18. Vivians made all seven of her shots during the run. Jailyn Mason scored 15 points for Arkansas (10-5, 1-1). KNOXVILLE, Tenn. – Jaime Nared scored 19 points, Evina Westbrook made a tiebreaking basket with 1:43 left and Tennessee outlasted Auburn to remain unbeaten. Daisa Alexander scored 16 points for Auburn (10-4, 1-1). The Tigers have won seven in a row. COLUMBUS, Ohio – Stephanie Mavunga scored 25 points and Kelsey Mitchell added 21 for Ohio State. Mavunga was sensational in hitting 11 of her 15 shots from the floor and grabbing five rebounds before leaving the game with 7:49 left. Ohio State (13-2, 2-0 Big Ten) won its seventh in a row, including all six games in the month of December. Destiny Pitts led Minnesota (12-4, 1-2) with 28 points. CLEMSON, S.C. – Nausia Woolfolk scored a career-high 18 points and Florida State beat Clemson for the 17th straight time. The Seminoles (14-1, 2-0 Atlantic Coast Conference) have won four straight since their 87-72 loss at No. 8 Texas on Dec. 17. Alexis Carter had 16 points for Clemson (10-5, 0-2). COLLEGE PARK, Md. – Kaila Charles scored 12 of her 24 points in the first quarter, and Blair Watson had nine of her 13 in the fourth quarter for Maryland. Maryland (14-2, 3-0 Big Ten) won its 12th straight and ended Iowa’s winning streak at seven. Megan Gustafson had 15 points and 15 rebounds for Iowa (14-2, 2-1). COLUMBIA, Mo. – Chloe Jackson scored 22 points, including four free throws in the last 10.4 seconds, and LSU ended Missouri’s 13-game winning streak. With Amber Smith scoring 16 of her career-high 27 points in the fourth quarter, Missouri (13-2, 1-1 Southeastern Conference) erased most of an 11-point deficit in the fourth quarter, but LSU (10-3, 2-0) made 8 of 10 free throws to hold on. Jordan Frericks had 19 points and 15 rebounds for Missouri. COLLEGE STATION, Texas – Khaalia Hillsman scored 20 points and Danni Williams added 19 in Texas A&M’s victory over Kentucky. The Aggies (12-4, 1-1 Southeastern Conference) rebounded from a 61-59 loss to No. 4 South Carolina in on Sunday. Maci Morris scored 22 points for Kentucky (8-8, 0-2). MADISON, Wis. – Katelynn Flaherty scored 20 of her 25 points in the second half, Hallie Thome added 20 points and Michigan gave coach Kim Barnes Arico the most wins in school history. The Wolverines (13-3, 2-1 Big Ten) never trailed en route to giving Barnes Arico her 124th win in six seasons. Barnes Arico had been tied with Sue Guevara. Courtney Frederickson had 16 points for Wisconsin (7-9, 0-3). Published: Jan. 4, 2018, 11:15 p.m.